Happy Monday, stamping friend! As the title says – Life is Better with You! Thank you for all the well-wishes; I’m hoping that I’m nearing the end of this awful cold/flu. I’ve been going through off/on fever bouts for the last week; that’s gotta end soon, right? 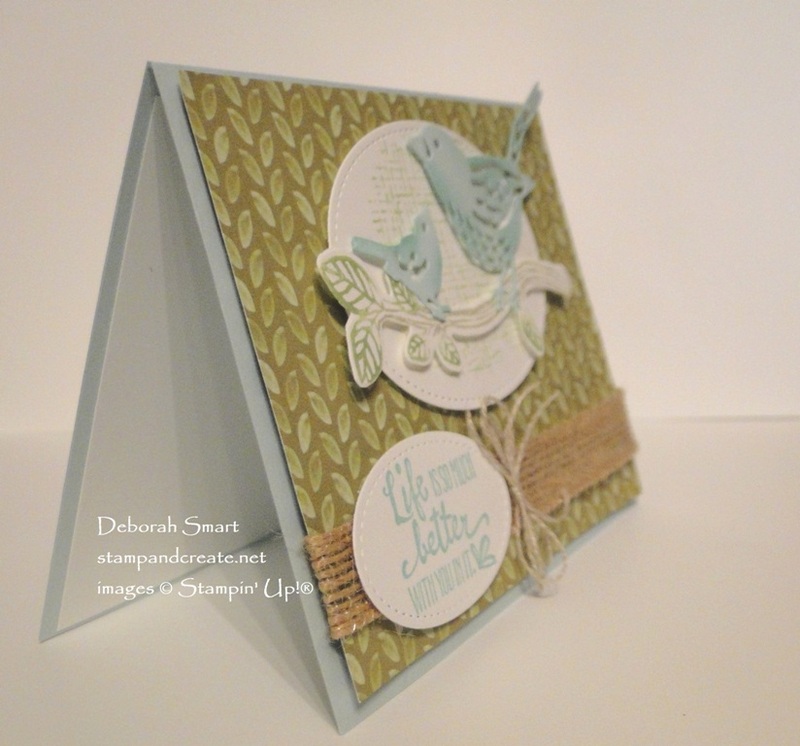 Anyway, I’m back today to share with you a cute card created with the Birds & Blooms thinlits dies. Since it’s the start of nesting season here, for the birds and other critters, I thought this card with the big and baby bird was appropriate! Start by colouring the branch stamp with your Stampin’ Write Markers in Crumb Cake for the branch, and Pear Pizzazz for the leaves. Stamp directly onto Whisper White cardstock. Die cut the birds with the Birds & Blooms thinlits, from Soft Sky cardstock, and die cut the branch, all with the Big Shot. From Whisper White cardstock, die cut a large and small oval with the Stitched Shapes Framelits. After die cutting the birds, use a Sponge Dauber and the Pool Party ink pad to sponge the birds, adding some colour and depth. In the middle of the large oval, stamp the cross-hatch image from the Best Birds stamp set in Pear Pizzazz ink. On the small oval, stamp the sentiment from the Petal Palette stamp set, in Pool Party ink. 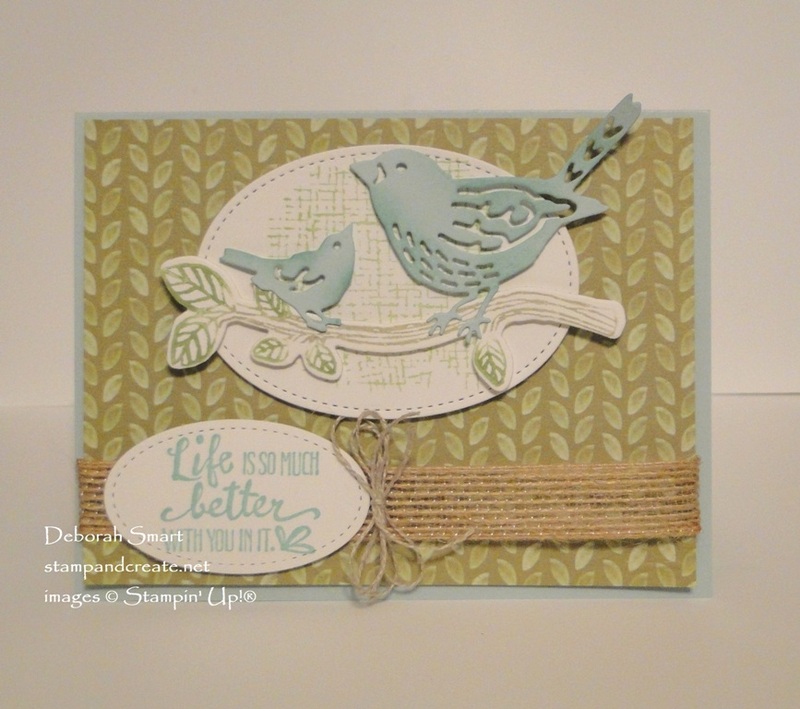 Attach the branch and birds to the large stamped oval with Mini Stampin’ Dimensionals. Then, attach the oval to a panel of Delightful Daisy Designer Series Paper. (Note – I think this DSP is now sold out – sorry! And a reminder – the Soft Sky colour is retiring, so if you want it – get it now!). Next, attach a length of Burlap Ribbon across the bottom of the DSP, attaching it in the back with Tear & Tape. Layer the sentiment oval on top of it, with Stampin’ Dimensionals. Tie a multi-loop bow of Linen Thread, and attach it next to the sentiment, with a Mini Glue Dot. Attach the panel onto a Soft Sky cardstock base, with more Dimensionals. Remember to add a panel of Whisper White cardstock inside, for your inside sentiment. ORDER YOUR SUPPLIES – QUICK, BEFORE THEY RUN OUT! As I mentioned, the Soft Sky colour is retiring, which means everything in that colour will be gone, as of May 31st, or before, depending on how quickly it sells out. You can check out the Retiring Products in my OnLine store. To shop, either click the product images below, or click on my signature. My store is open 24/7, so you don’t have to wait until ‘shopping hours’ to get your order in. If your order is $50 or over, please use my current Host Code KWPTAWEH, and I’ll send you a little ‘thank you’ in May! If you’re not signed up for my newsletter yet, you should do that today! Simply CLICK HERE to fill out your info (it’ll take you about 5 seconds). Then, at least 2x a month, you’ll receive my newsletter that has free project tutorials, stamping and stamping tool tips, up-to-date information on sales & specials, and my own specials, just for my subscribers! I’m also working on a fabulous special offer ONLY for my subscribers – so don’t miss out! Next Next post: Watercolour Pencils for the Win! This is such a sweet card, Deborah. I love those birds! I am glad you are starting to feel better! Glad you’re feeling better, Deborah!! And your birds are so sweet! Such lovely colors. They really look like they’re in a nest.